Cleaning up the home is a serious job. Space where you eat, sleep and just spend most of your time it needs to be kept in good condition at all times, or else, you could get sick. To aid with the task of properly cleaning your home, you will require the services of a reliable vacuum cleaner. In the Dyson V8 and the V10, you have two great options to choose from. Still, it would be better if you knew which one is the superior vacuum. In this article, we’ll take a closer look at the Dyson V8 vs V10 matchup to see which one deserves to be known as the better option. How Do Dyson’s Cyclone Vacuums Work? Dyson V8 vs V10: Which Stick Vacuum Should You Buy? 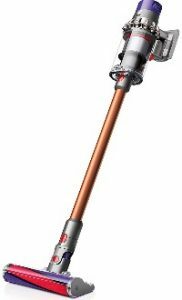 The Dyson V8 Absolute Stick Vacuum is a high-quality product that can provide years of great service. It’s a reliable item that offers remarkable versatility, power, and it can also keep going for quite a while on a single charge as well. All that said, that particular Dyson Absolute vacuum simply lags behind the V10 in enough areas that it just cannot be considered the clear-cut better option. The V8 offers great bang for your buck and it most certainly warrants consideration if you have a smaller budget to work with. However, if you are not adhering to a strict budget, there is no reason to pass on the Dyson Cyclone V10 Absolute and the performance it can deliver. I don’t like having to constantly switch between cleaning items when I’m working. Once I get started, I want to keep going until I feel that my home is sufficiently cleaned. That versatility is part of the reason why I love the Dyson V8 Absolute. Let’s start with the cleaner heads. The manufacturers give you the option of using either the Direct Drive Cleaner Head or the Soft Roller Cleaner. The Direct Drive Cleaner Head is useful for digging deep into your carpet and dislodging all those stubborn clumps of dirt that don’t want to leave. The other cleaning head is what you’ll want to use if you need to clean up your delicate hardwood floors. Proper home cleaning requires more than just two vacuum heads though, but don’t worry because Dyson still has you covered. The manufacturers have included a bunch of useful attachments that specialize in other types of cleaning. I particularly love the Crevice Tool because it enables me to continue cleaning even when I reach the smallest spots in my home. It’s also worth noting that this item can quickly be used to vacuum the car because it can be transformed easily. 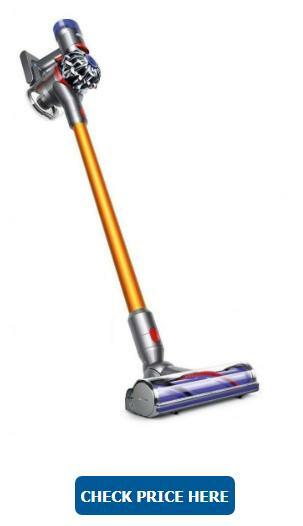 The folks at Dyson say that this stick vacuum cleaner can run for about 40 minutes on a single charge. That’s being very generous. Unless you remain extra conservative with your power usage, you will likely run out of battery life well before 40 minutes are up. The bigger issue I had with the V8 Absolute is that it can strain your hand after a while. Having to constantly press down on the power button puts your hand in an uncomfortable position. You may need to take a few breaks while cleaning using this stick vacuum. Even accounting for the flaws, this particular item is still a significant step up over the Dyson V6 cordless vacuum, the Dyson V7, and even the Dyson V8 Animal Cordless Stick Vacuum. Works on multiple surfaces thanks to different cleaner heads and attachments included. Offers a good amount of suction power. Makes a difference in the air quality in your home. 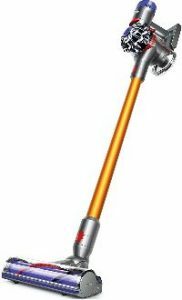 A more affordable Dyson stick vacuum. May not run for as long as you expect. Continuous usage could strain your hands. In this Dyson vacuum comparison, there really is only one thing you need to know if you want to understand which item is better. Simply put, the Dyson V8 Absolute is a terrific machine, but the Dyson V10 Absolute is superior to it in almost every single way. When it comes to cleaning attachments, the V10 also offers all the extras that are bundled together with the V8. That means you are getting the Crevice Tool, the Combination Tool, the Dusting Brush, and even the Motorized Tool that is designed to pick up pet hair. The Soft Roller Cleaner Head also comes packaged together with the V10, but instead of the Direct Drive Cleaner, you are given something more powerful. The Torque Drive Cleaner Head features even greater power than the Direct Drive variant. That Torque Drive head transforms the V10 into a carpet cleaner machine that excels at thorough operation. Run time is yet another area in which the V8 Absolute comes out ahead against the V8. The manufacturers note that this machine should be able to keep going for about an hour on a single charge, although they are being generous with that estimate again. Unfortunately, the issue with the troublesome power button does return in the V10 Absolute. It’s far from a deal-breaker though, and you can get used to it over time. Clearly, the V10 Absolute is a better performer than the V8 Absolute and it also compares favorably to the Dyson V10 Animal. The price tag is on the high side, but this Dyson stick vacuum is worth it. Has no problem working on different types of surfaces in your home. Compares favorably in terms of performance to other products, including the Dyson Animal Cordless vacuum. Improves your home’s air quality. Features slightly longer run time compared to the V8 Absolute. Power button still needs to be pressed down constantly to use this vacuum. One of the more expensive vacuums on the market. While in use, a Dyson cyclone vacuum will clean the carpet with the use of brushes and a strong fan that offers plenty of suction power, according to ABC News. The debris-filled air then enters a chamber in the vacuum where it will continue to spin around at a high rate until the larger unwanted particles are separated from the air. The air will move into another chamber next where smaller dirt particles are removed. HEPA is an acronym that means high-efficiency particulate air, according to Sarah Aguirre the author of The Spruce. That specific type of filter is useful for getting rid of smaller particles in the air. When you’re using a vacuum with a HEPA filter, you can more effectively clean the air and get rid of dust particles and other allergens that may irritate the senses of the people living in your home. Let’s make one thing clear right away, whether you choose to get the Dyson V8 or the Dyson V10, you are going home with a high-quality stick vacuum. In compare to smart vacuum or a Shark vacuum, I also believe that those Dyson creations can more than hold their own. The truth is that your budget will likely dictate which vacuum you end up buying. If you have the money for the V10, then there’s no reason to settle for the V8. If you are looking to save as much as possible, then the V8 is probably what you’re going with. There is no wrong option, though there could certainly be one more compatible to you depending on your shopping budget. In a way, the matchup of the Dyson V8 vs the Dyson V10 comes down to performance against price. When it comes to quality components, both stick vacuums are not lacking, but it is clear that the V10 is the one capable of reaching a higher level of performance. Then again, the cost of that premium performance is a higher price tag that may not be more affordable to a larger number of people. I would personally prioritize getting the Dyson V10 because it is such an effective home cleaner, but if that’s not an option, ending up with the Dyson V8 is a fine consolation prize.